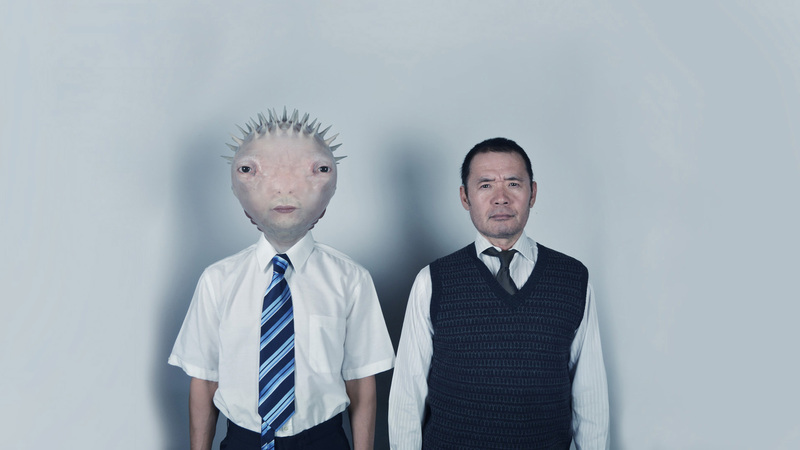 Two Japanese salary men's lives literally transform when one of them eats a live puffer fish in a sushi bar. If you like sushi, Japanese culture and visual FX – then we’ve got a bite-size treat for you. With Fugu & Tako director Ben West serves up a fun, unique and down-right weird short film that follows its titular oddball duo as a night on the town leads to some unexpected changes in their relationship. A film we’ve had our eyes on for sometime here at Short of the Week HQ – this film’s compact run-time and comical premise makes it an ideal fit for the world of online video. The story of how one man’s demand for his sushi to be as fresh as possible leads to a transformative experience, director and writer West admits that he’s “always been attracted to stories that see characters go through great transformation”. Inspired to create the narrative whilst staring into a live fish tank and eating sushi at a restaurant, the director revealed to Short of the Week that he approached the film as “an opportunity to explore the idea of something really bad happening to someone but seeing some benefit come from that”. “That was the kernel for the narrative”, says West, “it evolved from there to become a buddy story exploring themes of friendship and how change in our lives can affect our relationships”. “I realized performance is not something you listen for, its something you see. It completely changed my approach to directing and working with actors”. Shooting a film in Japanese when you don’t actually speak the language might sound like a somewhat foolish move, but West was so dedicated to stay true to the on-screen universe he was creating, he admits it was an idea he had no choice but to run with. “In part I wanted the audience to maintain a suspension of disbelief” says West, “it might sound a little weird but basically I needed the audience to believe a man could feasibly transform into a Pufferfish. Speaking in Japanese brought an extra level of authenticity to the experience. I don’t speak Japanese so it presented some challenges. Fortunately the actors could speak English so we were able to communicate between takes. During filming I couldn’t understand a word being spoken so I relied on the emotional arcs in each scene. I realized performance is not something you listen for, its something you see. It completely changed my approach to directing and working with actors. A huge part of it is trust. I guess that’s part of the appeal of films with subtitles. Often you can’t keep up with the text but you follow the story tracing the actions of the characters. My role on set was to be the audience watching the film. The subtitles were the script in my hand”. With over 15-years experience in the VFX industry, you would expect the post-production in West’s film to be on-point and it certainly doesn’t fail to impress, but the director was keen to make sure this wasn’t just a film of style over substance. “One of the greatest things I’ve learned”, he says, “no matter what the approach to filmmaking, the end results should always serve the story. Performance is paramount in achieving that goal so for Fugu & Tako I ensured the actors had as much freedom on set as possible. I didn’t want technical details getting in the way. There are a multitude of ways of resolving VFX requirements without limiting approach. In order to capture the actors performance we simply used a swimming cap with tracking markers and a witness camera for animation reference. We shot with handheld cameras, starting with traditional coverage that evolved into a documentary style following the characters in a more observational way. There were no limitations. In many ways the shooting approach was no different to any other film. The benefit of being a director with VFX experience allows you to simply capture the story knowing instinctively how effects will play it’s part”. West says he’s often asked if he’d create a feature length film based on Fugu & Tako and the director admits that a longer version exploring bigger themes would appeal to him. For now though, he has a few other projects in the pipeline, West wouldn’t reveal too much about them, but apparently they involve “aliens, a three armed man and zombies” – if that’s just one film…I’m in. If you enjoyed the world of Fugu & Tako, then don’t miss out on your chance to see more – director Ben West has started a Kickstarter campaign to take their story to the world of the graphic novel.